A popular breakfast and tea bread, especially in Britain and the United States, which is usually made with a dough of bread flour or all-purpose flour. Some varieties are enriched with eggs, butter, and/or milk. The dough is usually baked in a loaf pan although a bloomer shape is also popular. Some commercially prepared brands are baked in a Pullman shape and are sliced before packaging. 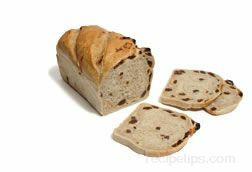 There are numerous recipes for raisin bread and most feature the addition of cinnamon, which sets off the flavor and sweetness of the raisins. Some Scandinavian and Eastern European recipes contain varying quantities of rye flour, which provides an earthier flavor. Raisin bread is especially good when toasted and spread with apple butter, which is a delicious complement to the raisins and cinnamon flavors of the bread.